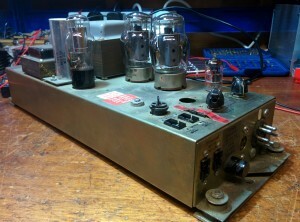 This Leslie 147 amplifier module belongs to local composer and sound engineer Guy Meredith. It’s normally hooked up to a Hammond organ at his studio, but came to us with very little wrong with it. It turns out that the original 6550’s are so well built that they are still in good condition. The 12AU7, however, was worn and needed replacing (in order to bring the signal back up to it’s original level). A lovely example.